This book is a truly remarkable account that captures the atmosphere, thrills and danger of the pioneering days of aviation. Howard Pixton was flying for A V Roe at Brooklands in 1910 when S F Cody at Laffan's Plain tried to persuade him to join him. But in 1911 he test flew A V Roe's 'tractor biplane, the forerunner of the 504. By now acknowledged as the first professional test pilot, he left A V to join Bristols and for two years demonstrated new models to dignitaries across Europe. In 1913 he joined Tommy Sopwith and in 1914 he became the first Briton in a British plane to win an international race, the coveted Schneider Trophy. This gave Britain air supremacy and Howard was feted as the finest pilot in the World. Sopwith's Tabloid aircraft developed into the 'Pup', and then into the 'Camel'. Throughout The Great War Pixton test flew many of the rapid evolving designs. 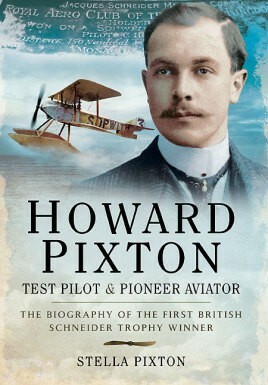 For a biography of an early aviation pioneer of the top rank, this book cannot be bettered.